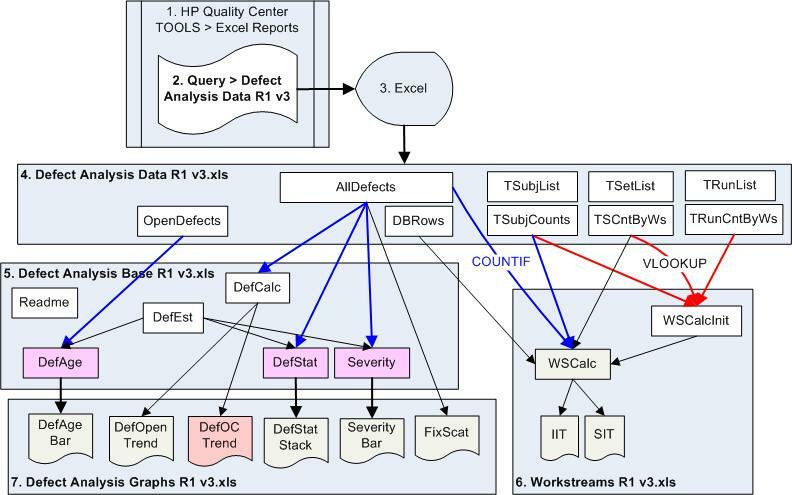 This is an unabashed review of how to use HP ALM Quality Center (to version 9.2) despite annoyances. What is Quality Center/ ALM? Quality Center (QC for short) is a web application software product offered by the Software division of HP (Hewlett-Packard), one of the largest corporations in the world. QC was one of several products (along with LoadRunner, WinRunner, Quick Test Pro, as well as IT governance products) HP purchased with its acquisition of Mercury Interactive in 2003. Over time, this product's name changed from "Test Director" to Quality Center (QC) to ALM (for Application Lifecycle Management) in 2010 at QC version 11, when the product's value proposition became the management of Requirements, Test Plans, Test Execution, and Defects in a single system. The ALM product name is a little confusing because the "ALM edition" of the ALM product replaces "Quality Center Premier Edition". QC "Enterprise" and "Starter" editions carried into ALM. Furthermore, with version 11, ALM also became the database for HP's Performance Center (PC) enterprise performance testing product. So this article refers to "Quality Center" and ALM/QC as equivalent synonyms. The expansiveness of the ALM/QC product line makes it popular among corporate CEOs and CIOs. The decision to adopt ALM/QC is often made between just HP salespeople and C-level executives (CEOs and CIOs) who pitch how management can get better visibility and control into the QA department. This management-oriented "business proposition" and "payback" sounds so enticing that executives often don't feel a need to get full input from technical people or to evaluate "minor technical" details (imagine the dismissive hand waving). Why inject negativity? Linkages among data is confusing. The amount of manual effort to input data for management may make those down on the ground doing the work feel they must make the "Sophie's Choice" of either disappointing executives who bought ALM/QC (to "make your lives easier") or getting the "real" work (of testing) done. Some assume that QC is stuck in the "waterfall" approach of software development some see as necessary to work with "off-shore" workers in "third-world" countries. Workers with this assumption see QC as a device to input data under a command-and-control approach to management reporting rather than as a tool to enable collaboration among workers (especially among testers and developers). This assumption puts the product at odds with signers of the Agile Manifesto, preferring "customer collaboration over contract negotiations". The default workflow assumed by QC results consumes more disk space (and effort) than one would assume. Standard reports lack depth of managerial critical thinking and personalization. For a web application running on Internet Explorer, the ALM/QC GUI is quite sophisticated: graceful timeout management, drag-and-drop, right-click context menus, pop-up dialogs with menus, column width adjustment by users, and other GUI goodness. All this is enabled by a large set of ActiveX components loaded while it starts, like Adobe Flash web apps. So people do have to wait upon URL start-up. The flip side is that the ActiveX libraries also enables use of a custom communication protocol which enable faster binary exchanges between client and server than whole HTML pages. Also, pauses will occur occassionally since ALM/QC is a Java app on a server with JVM garbage collection. The ALM/QC installer comes with a default installation of JBoss. But HP has tested the app running on IBM WebSphere and Oracle WebLogic. Patches over time enable additional support. To track Assigned Requirements coverage, each requirement (product backlog item) are linked to some Release Cycle. This may make replanning a cumbersome process. Requirements are linked to a Test Set Folder containing Test Sets which in turn contain manual and/or automated tests strung together. REMINDER: Requirements are not directly linked to Test Sets because several Test Sets can apply to a requirement, in one-to-many relationships. Requirements can be "converted" to Tests run in the Test Lab for one-to-one test coverage linkages. Subjects in Test Sets are copied from the Test Plan module into Tests within the Test Lab module. QC provides filtering and drag and drop GUI to do this quickly. To avoid execution notes in Test Lab instances becoming stale, they are not automatically changed when subsequent changes occur in the Test Plan. Some keep version numbers for each Test Set and note that after creating Tests from the Test Set. But the best practice is to create in TestLab Test instances LINK-ALERTS triggered by changes in its source Test Set. To enable calculation of executed coverage, each test run is manually created and designated with the Test Set it is based upon. What Do You Call That, Again? The alphabetical list on the left (with objects in singluar form) is from the menu only admininistors use to define custom fields, which does not occur frequently. It's a good idea that administrators avoid using this as the basis for describing content in the database. The hierarchy on the right is from TOOLS > Document Generator used to create detail reports. This is perhaps the best structure to use as a basis for defining a common vocabulary. This matches text such as "Subject" at the top of the Test Plan component hierarchy tree. This also matches the "Test Set" at the top of the Test Lab component hierarchy tree. Those coming from or transitioning to other systems (such as ScrumWorks or Microsoft TFS) would need to memorize equivalent terminologies. For example, ScrumWorks uses the word "Themes" within "Epics" to organize what needs to be achieved by each release. There are several mechanisms which make entry of data less onerous. AML (ARIS XML) file formats using BPMN 1.1 (Business Process Modeling Notation) and EPC 7.1 (Event-driven Process Chain) notations created by ARIS (from SoftwareAG). One clever and user-friendly aspect of the database design is that administrators can define new custom fields without needing a DBA to change the schema of the database. This is because several fields named USER_... is pre-defined in the database. To make use of a field, the administrator simply changes the title associated with a USER field. For example, SQL to access custom fields about defects (bugs) reference fields named BG_USER_01, etc. The names of tables and columns within the database need to be known to those crafting SQL for Excel reports. ALM/QC provides batch import capabilities in add-ins to both Excel and Word. But most people use Excel rather than Word (which requires each element to be marked). Standardize on a template that contains only the fields needed for your organization. I have some to show you. Use separate templates for importing requirements and test plans. Create data edit macros and run them before importing. Backup existing data before performing the import. It is desirable for the hierarchy of test sets and test runs to take several forms over time. So I've developed scripts to restructure hierarchies based on the value of fields, which I customize to each organization's unique vocabulary. Before the restructing occurs, an edit script is run to ensure that each such field contains data valid to construct the hierarchy. Ironically, in fear of being allowed to crash the database, those using SQL to manipulate hierarchies are often denied the permissions needed to create temporary tables needed to efficently work with hierarchies. Also, although updating the schema to add a hierarchy level number column would make SQL queries easier and much more efficient (and not require temp tables), most organizations avoid doing so out of fear, and thus paralize QC administrators as well. Measures help us approximate less tangible metrics used to imagine process changes to achieve better metric scores. For example, body temperature and body temperature trend are measures. An individual instance of a measure is a measurement. "Health" is a metric. In business, market share, profit margins, and customer satisfaction are metrics. The most useful measures are based on workflow tasks (what people do) which serve as predictors of where time and budgets might need adjustment. Although Quality Center provides many reports and graphs out of the box, some complain that they are conceived from a too technical point of view, providing simple counts without personalization to vary for each role's unique need for different fields, sorting, and filtering. Organizations need more complex reports and graphs than QC provides by default. The chart (at right) is prominent in the software to summarize progress toward "completion" at several moments over time. At the last reporting period shown (on the far right at end of the ribbons), 100% of Requirements are shown as "Assigned" by the purple ribbon at the top. BLAH: Those who have taken a system through implementation know that new Requirements inevitably crop up. So managers need to include quantification of "unknown unknowns" (an estimate of how much work might be added along the way), to provide information for staffing purposes. From the point where the yellow ribbon end, follow the marker line to the left and around the corner to realize the "Planned Coverage" is 60%. Those presenting this chart need to be prepared to answer the naive but valid question of "why were only 60% planned coverage"? Many in our culture assume that 100% (or even "110%") is the usual goal. A skilled manager would ask for an analysis of the economic trade-offs between risk and work, as there may not be payoff in doing everything planned, as there is less liklihood of finding a defect per unit of testing investment. It is a bad assumption is that whatever is planned (yellow line) "should" be executed (dark red line). Practically, however, it is often desirable to have plans for more work in case other items are blocked, which frees up time for additional work elsewhere. However, within the default ALM/QC structure, it is difficult to differentiate between items commited to be executed versus items held in reserve. I think it is a bad management tactic to measure test lab execution on a 100% scale because we want testers to define more tests than they plan on running so that if certain items get blocked, they would have already defined additional tests to run immediately rather than just waiting around. Judging testers based on a default 100% would discourage (indeed penalize) testers for being proactively productive. What Are The Numbers Supposed To Be? The default reports only say how many of each type of data are in the database. But missing is what number is supposed to be there (at various moments of time during the project)? Tracking the percentage of test plans (or other items) planned versus entered in the system is where SQL and Excel come in (next section), since this is not a default part of ALM/QC. Many don't bother with additional reports not because of the technical challenges, but because of politics. Putting out a projection would "hold their feet to the fire". For some reason, most test managers are allowed to say that they can't predict how many defects will be produced. Unfortunately, most sales managers don't have such a luxury. Stockholders and the SEC require them to provide "guidance" each quarter. Whether it's publicly voiced or not, organizations make some prediction about how many defects they expect in their staffing actions. If NO developer time has been allocated to analyze and fix bugs, then expect NO bugs to be found. If later there is a scamble to find time to address bugs found, then some "mismanagement" has occured. Skill at predicting future events is a learned skill, and require insightful dialog among development and test managers, something that is lacking in many organizations. This is why one of the Agile Manifesto items is to prefer "individuals and interactions over processes and tools". This gap is answered by software supporting Agile approaches which produce a burn-down chart such as this for points of functionality being developed by "Pigs". In this example (produced by Rally software), each column illustrates the count of "function points" at the end of each day. The blue column is the backlog of how many remain to do. In organizations that practice Agile, this chart is reviewed during daily scrums facilitated by a Scrum Master. Each column defines the work for each sprint of fixed duration (1-3 weeks each). The starting backlog is defined for each sprint are agreed upon based on a prioritized list of functionality maintained by the Product Owner. Prioritization of features developed within each sprint is based on estimates of business value and effort obtained during Sprint Planning workshops and Product Backlog Refinement workshops. The diagonal line in the basic burn-down chart is labeled "ideal" because it represents ideal circumstances (not management expectations). The difference between ideal and actual progress reflect blocks the team encounters. The rate that features are worked off is (the team's capacity of items each sprint) is called its velocity. Agile practioners prefer the horizontal time frame (including the length of each sprint) to not change to foster learning needed to improve the accuracy of estimating skill. ALM/QC was built to track individual tasks and the hours of work associated with each. It can also differentiate between completed (Accepted) items as green columns count versus items still to be processed as blue columns. However, an important difference with Agile vs. traditional approaches to project management is that generalized points are used instead of absolute man-days so that estimation bias can be more easily adjusted for reality and individual bias. Additional processing (by Rally) adjusts estimated completion dates based on Scrum estimating techniques. Such an approach requires custom fields in the QC database. Rally maintains this chart by establishing a two-way exchange of data with ALM/QC. But this should be done with the understanding that there is a fundamental difference between Quality Center and Agile/Scrum in that ALM/QC forces estimates, whereas with Agile an "epic" can remain as such without being associated with a numerical budget of time. To avoid "putting a lipstick on a pig", technologies need to focus on communities of practice. ScrumWorks' Enhanced Burndown chart has a more informative presentation which differentiates "headaches" (work to remove defects) from original effort planned. Some may find this too sophisticated / confusing. The length of each bar  the total effort remaining after each period  is after a push down the original effort plus a push up to work off the headaches/defects remaining. An enhancement to this are different colors to depict new headaches/defects added during the period. The red diagonal line displays the Best Fit line depicting the average velocity of burndown. Periods of slower progress would have bars floating above the red line. Periods of greater progress would have bars below the red line. Producing a burn-down chart does not make an organization "agile" nor does it mean management is "in control". Burn-down charts do not address management of progress in all aspects of software development. One of the Agile Manfesto items -- "Responding to change over following a plan" -- is a massive paradigm shift with the Agile movement coming into vogue early in the 21st century. Being Agile takes a change in mindset about responding to change through constant communication and adjustment rather than pre-planned expository and adversarial contracts. An organization does not really "get" Agile if a "Scrum Master" or supervisor writes up performance reviews on programmers based on burn-down charts or whether detailed specs were developed according to management expectations. 9780521191814.jpg / gif Agile Testing: How to Succeed in an Extreme Testing Environment by John Watkins (of IBM) (Cambridge University Press, 2009. 328 pages) Presents twenty real-world case studies of practitioners using agile methods, eliciting best practices. 9781599042169.gif Agile Software Development Quality Assurance by Ioannis G. Stamelos and Panagiotis Sfetsos (eds) (IGI Global, 2007. 268 pages) Providing in-depth coverage of important concepts, issues, trends, and technologies in agile software, this guide helps researchers and practitioners avoid risks and project failures that are frequently encountered in traditional software projects. 9781584503644.gif Integrating Agile Development in the Real World by Peter Schuh Charles River Media © 2005 (364 pages) IT professionals struggle with integrating agile practices and processes into traditional project environments. This text provides programmers and managers with specific ways to implement and use agile processes in everyday software development projects. ISBN:9780470073865 Software Development Rhythms: Harmonizing Agile Practices for Synergy by Kim Man Lui and Keith C. C. Chan John Wiley & Sons © 2008 (308 pages) provides programmers with a metaphor for resolving classic software management controversies and dealing with common difficulties in agile software management. ISBN:9780735625679 Agile Portfolio Management by Jochen Krebs Microsoft Press © 2009 (240 pages) Delivering practical, real-world guidance on bringing agile software development methods to your entire enterprise, this practical guide provides specific suggestions for improving processes, developing clear roles, and making decisions. ISBN:9780849393839 Manage Software Testing by Peter Farrell-Vinay (Auerbach Publications © 2008 (600 pages) Covering all aspects of test management, this book guides you through the business and organizational issues that you are confronted with on a daily basis, and explains what you need to focus on strategically, tactically, and operationally. CI tools include Selenium, FitNesse, Cucumber, and Concordion. Unlike "heavyweight" test management approaches managing a backlog of verfication work by testers, the Agile approach finds wisdom in automated "Continuous Integration" (CI) and developers incorporate testing as part of their own work. The advantage is that potentially shippable product increments (pspi) are produced throughout the life of a project rather than everything in one big monolithic big bang release. ALM/QC supports the use of continuous integration build tools -- Thoughtworks' Cruise/CruiseControl, Hudson, and commercial tools Jetbrain's TeamCity, and Microsoft's Team Foundation (TFS) Build. These plug-ins insert themselves as a build step which triggers QC Test Sets and publish build results. Those using the ALM (Premier) Edition to use several projects at once create hub projects, which gets updated from individual projects when the Synchronizer runs. The Synchronizer works with other 3rd-party products as well. True Agile practioners do not differentiate between testers who file bugs and developers who fix them, since both work toward the same definition of "done". Instead of QA saying "it's done when I say it's done" (after developers say they are done), an interdisciplinary team gets done faster together. In a "hybrid" Agile world, testers are embedded among developers so issues of "testability" can be easily discussed and solved. 100% coverage is assumed with Agile. This includes testing on various browsers and against various internal conditions. The "test first" concept with Agile is that code to validate whether the code being developed works before that code is written. Thus, code is written to satisfy verifiable goals. Code to verify whether the program can catch a negative test case is written before application code to recognize the situation. This is a result of the Agile Manifesto of preferring "Working Software over comprehensive documentation". Developers can update user stories, tasks, and defects from within their working environment (Eclipse IDE and MS Visual Studio) after installing the ALM 11 plug-in (like Resharper). Bi-directional synchronization of requirements, epics, user stories, defects, tests, and more with CollabNet TeamForge/Eclipse is enabled by an ALM/QC integration add-on. What testers need to know is the completeness and quality of developer builds. The frequency of broken builds is one indicator of code quality. One of the key innovations with the SCRUM approach is that instead of single-specialists, teams focus on customer-driven features are cross-functional, multi-learning, working on cross-component features. This is a hugh change in the organizational structure mind-set needed to avoid bottlenecks and achieve large scale development quickly. This needs to be reflected in the permissions structure. QC provides a way to limit what actions (such as add, delete. etc.) different groups can do in each project. Different permissions is a big reason for having data in different projects. QC currently does not provide a mechanism for restricting actions on specific values within a project. Someone allowed to make deletions can delete any item within a project. A user group can be restricted from viewing defects assigned to others if the Admin. creates a defect data hiding filter with filter conditions. In each table, define a user field with a name such as "workgroup" or "owner" to designate who has responsibility for its maintenance. This would establish accountabiity for "clean-up" activities. When reports are filtered by this custom field, the report is applicable to each specific group (much better than requiring eveyone to ignore everyone else's data). ALM/QC requires both a database server and installation on an application Server, not Windows XP nor Vista desktops. ALM/QC is a complex system, with patches and scripts that can cause major problems. To learn the system, users need a project with the set of data described in HP's User Guide documentation. To to test out patches, upgrades, and to develop scripts, admistrators need a dev environment to avoid messing up the production environment. The dev environment is in addition to production and an environment for production staging and fail-over. QC's dashboard requires yet another database. Make the name of the training (sample) project the same as in the manuals. However, make a copy of it before anyone touches it. This pristine copy should be occassionally but regularly copied on top the training project which can get trashed over time. If QC 9's built-in Version Control system was not enabled, each change in data wiped out whatever was in the database, with no hope of recovery. Restore from a complete database backup was cumbersome because it's an "or or nothing" restore. Given this default restore capability, organizations have gone to preventing "ordinary people" from being able to delete data. They must move items to a hierarchy item such as "zzz_deleted_trash" Then, only people who "really know what they are doing" can permanently delete items moved there. This leads to a whole set of unintended consequences (in addition to the emotional resentment), such as extra overhead on defining and setting permissions on who can do what, plus more complexity (and mistakes) in SQL to generate reports. But with ALM 11, QC has a version management system that is superior to stand-alone products for text-based source code because versioning is at the individual element level rather than entire files at a time. The cumbersoem side of versioning is that one cannot decide on the fly to make a change. The system assumes that one can cogently describe what is to be changed before seeing that data. Sites may still want to have a stand-by environment to handle fail-over. ALM 11 ALM (Premium) edition enables tools for sharing and synchronizing libraries of assets among multiple projects and reports consolidating multiple projects. In the Management module, a library contains pointers to a group of assets. It can be used to share objects across projects. A baseline is a snapshot of assets. When a baseline is pinned to a Test Set, only tests that cover requirements in the baseline can be added to it. As with any enterprise database, the Quality Center database must be watched to ensure that it is built with the correct number of extents from the start and that those extents are extended as planned. This is to avoid disruptions from the database crashing when it unexplectedly runs out of disk space. When the database is first setup, I recommend that (before doing any real work), do an experiment  setup a very small extent and alerts, then allow the database to run of room. This way you can see whether those who are supposed to receive alerts are indeed getting them and respond to them. To anticipate turnover in DBA staff (both temporary or otherwise), have email alerts sent to a email group of DBAs. Have a set of SQL queries and scripts that graph results run each week to obtain and display the trend of row counts in key tables within the database. All this is necessary becasuse the default workflow (business process) causes more disk space to be consumed than one would assume, due to the linkages among items in Quality Center. For example, each test item must be copied to Test Lab. If it is done, SQL would be used to extract counts of what has been entered. This would be imported into Excel, which produces a table or chart comparing actual versus planned counts. The file "Defect Analysis Data R1 v3.xls" is replaced whenever it is generated from SQL within QC. Each tab in the SQL within QC is produced as a separate tab in the output spreadsheet. Another spreadsheet (the Base spreadsheet) references the Data spreadsheet. A third spreadsheet then produces charts by referencing the Base spreadsheet. The trouble with this approach (using Excel) is that these need to be run on a specific date (e.g., every Friday at noon) so that counts at each particular point in time can be captured when it's available. A program to generate the count of each at various points in time can be generated, but would require more complex code. To it's credit HP does provide many ways to create custom reports. But there are so many different technologies to create reports that a manager may have to use several technologies to get a complete picture. During my consulting engagements, I customize from working generic examples refined over several engagements. To get serious with managing software, ALM/QC data should be treated like other corporate metrics, and get integrated with the corporate dashboard (BI system). Here is a flowchart of how data goes in and out of Quality Center. Point-in-time static reports archived on SharePoint, etc. HP provides its OTA (Opent Test Architecture) API to enable VB programs to programmatically perform user actions. Bug1.Field("BG_DESCRIPTION") = "automatic created defect"
The above (with some code removed for clarity) is extracted from LoadRunner VB OTA scripts HP R&D created to conduct ALM 11 performance benchmarks. As of this writing, no LinkFactory is available to create links to defects. HP Support acknowledges this. OTA VB programs use Microsoft's COM interface which uses the vbrun60sp5.exe (VB6 SP5) run-time (published in 2001) rather than the newer (but much larger) Microsoft's .NET run-time. Micorosft does not plan on supporting the VB6 run-time past Windows 7. Microsoft Visual Basic 6 32-bit IDE, although no longer supported by Microsoft as of April 8, 2008, is still used by many developers who didn't have the time to migrate VB code to VB.NET. Differences between VB6 and VB.NET code. Microsoft Script Editor (MSE), came with Microsoft Office until 2007. In its About Box, it calls itself "Microsoft Development Environment 7.0", a trimmed down version of Visual Studio .NET 2002 (7.0)'s IDE. HP Exam HP0-M15 for 9.2 replaces Mercury exams QC82SP, QC90SP, HP0-M11, HP1-M11.